ZIMBABWE is in pain. Cyclone Idai is killing our loved ones and destroying our infrastructure. But in all this anguish, Zimbabweans – across the socio-economic and political divide – have come together and expressed love to Manicaland in her hour of darkness and need. Led by the government, which has availed $50 million towards, hordes of Zimbabweans have made it a personal goal to contribute something towards making the situation better for victims of Cyclone Idai. The only thing Zimbabweans have failed to do is restore the lost lives – whose official figure stood at 82 by close of business yesterday – but a lot is being done by individuals and corporates to restore normalcy to devastated Chimanimani and Chipinge. 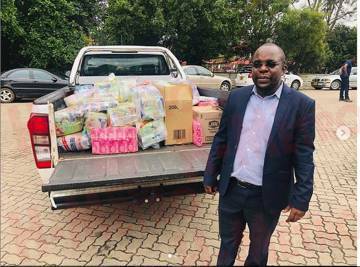 Advocate Fortune Chasi was among the first people to set the ball rolling when he called for donations through his twitter handle before getting an overwhelming response. Ditto corporates like Econet, NetOne, TelOne, Zimbabwe National Army (ZNA), Zimbabwe Red Cross, Zimpapers, AB Communications, AMH, The Footballers Union of Zimbabwe, schools . . . and individuals like Themba Mliswa, Jah Prayzah, @esagomba (Twitter handle) – the whole country is showing love for Manicaland. The ZNA has been busy conducting search and rescue missions in Chimanimani and other affected areas. Econet has called for monetary donations through their biller code 320041 and have promised to double whatever people send. The response was great and screenshots of various amounts from well-wishers were posted under their post as proof that their call had been heard. Zimbabwe is full of love. 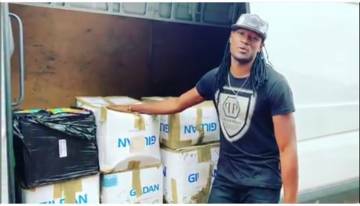 The number of artistes and celebrities that heeded Jah Prayzah’s call for donations was humbling. From Soul Jah Love to Kapfupi, from Seh Calaz to Kadija, Oscar Machapa, Chief Jose, Olinda Chapel and husband Tytan (sent representatives), DJ Towers, Ric Chasers, Chippaz they all made a beeline to Jah Prayzah’s offices. But even more exciting was the response from music fans who did not seek any glory or publicity. 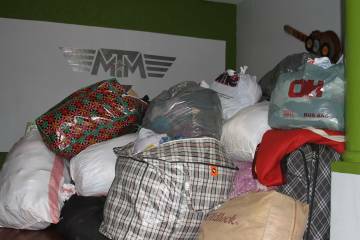 They simply rounded up their clothes, groceries, money and responded to the plea by Jah. They came, left their goods, greet Jah, maybe have a couple of selfies taken, and then leave for their normal day to day activities. They already had the love and all Jah Prayzah offered them was a means through which they could express their love. Jah Prayzah’s invitation was simple: “Let’s join our hands our hands and help those who have been affected by the Cyclone. No donation is too small to make a change. Anything you think can assist those in need right now in Chimanimani, please bring it over. 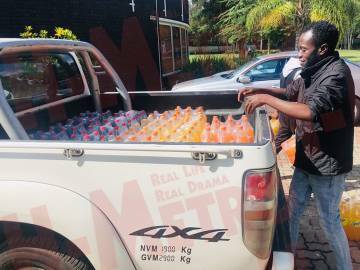 When H-Metro visited his offices yesterday, the musician was very excited and overwhelmed by the response he had gotten from his fans. “Honestly I’m humbled and touched by everyone who has chosen to participate in this initiative as it is for a great cause. “As you can see the room is almost full and people are still coming in, I’m very happy because people are showing unity, this is our culture as Africans, when one of us is down, we help them until they are on their feet again. 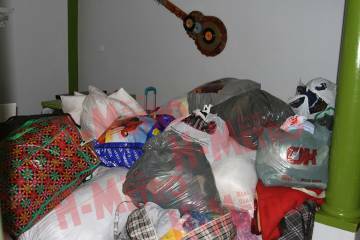 “There is food, shoes, clothes and I know these donations will help somebody who is in need. “We will also be taking donations tomorrow (today) until end of day,” he said. However, we cannot all go to Manicaland to make these donations. In a statement, The Civil Protection Unit (CPU) appealed to the general public to avoid visiting the Cyclone ravaged Chimanimani and Chipinge areas. According to the organisation, increased traffic is causing road congestion that is disturbing the transportation of relief supplies and slowing down rescue efforts. 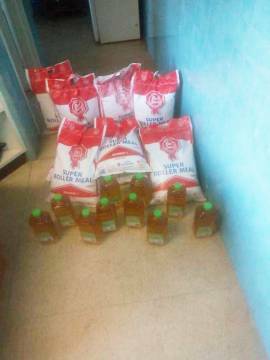 Meanwhile, the Zimbabwe Consolidated Diamond Company (ZCDC) also made a donation which includes meal mealie, sugar, beans, tea leaves, matemba, 40 plastic buckets, matches and candles. 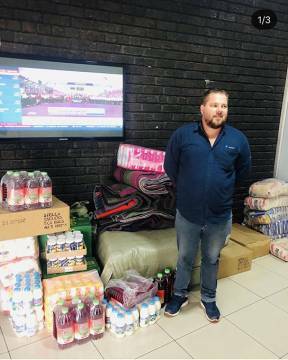 A well-wisher from Mutare gave 10 000 litres of diesel towards the cyclone relief efforts. The love was just pouring in! The events in Chimanimani and Chipinge maybe sad, tragic even, but they have once again proven what a united and loving people Zimbabweans are.